The developmental timeline of Reynolds Lake Oconee (formerly Reynolds Plantation) is a little like the biological evolution of the human species. As time passes, organisms (in this case, golf courses) multiply, establishing themselves in their surroundings while slowly developing complexity surpassing previous versions. Eventually they become highly specialized within the context of their ecosystem until, finally, they’re advanced to the point that they’re able to overcome environmental limitations and impose their will on nature. From Reynolds’ nearly primitive original Bob Cupp Plantation Course in the mid-1980’s (now renovated and called The Preserve) to the opening of the sixth course, Jim Engh’s hybridized, multi-dimensional Creek Course two decades later, there’s an evolutionary through-line of style and complexity, not to mention a progression in how the courses interact with, and sometimes overwhelm, the land. If this were a human evolutionary continuum, Great Waters, the development’s second oldest course, might fall somewhere between Homo erectus and early Homo sapiens. And for early Homo sapiens, it would be a fantastic looking specimen considering this is one Jack Nicklaus’ loveliest and most graceful courses of the 1990’s (it’s currently closed for renovation until late 2019). Compared to Reynolds’ subsequent designs (Reynolds National, The Oconee), Great Waters is refreshingly simple and refined. 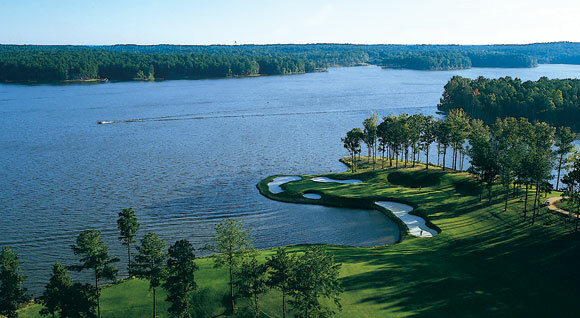 Nine holes play to the shore of Lake Oconee including eight on the homeward nine alone. They rise and fall through the wooded hills and emerge evocatively upon beautiful watery backdrops. Apart from the short par-4 11th where a small inlet and a necklace of bunkers cosset a wide but shallow peninsula green, Nicklaus’s shaping and hazard arrangements refuse to compete with the lake views. He clearly wants the water to be the topic of conversation and the architecture steps back to allow the lake’s shoreline to do the spiritual lifting. There are a few designer-imposed flourishes to impress panel raters and prompt clubhouse chatter like the gut-check cross-water approaches on 9 and 18. Visitors will also drool over holes like the par-3 14th and 17th that demand fly-over shots across coves of Lake Oconee. But the best hole on the course is completely away from the lake, the mid-length par-4 5th with a small creek that crosses the fairway once diagonally and then again in front of a slender green creating an interesting elasticity in drive aggression and approach angles. If the 5th is the most composed, mature and interesting hole on a rather mature and interesting course, it must say something about the wisdom of leaning so heavily on the lake for overall effect. Such is the nature of water when used as a hazard, as grand and plentiful as it might be here: it still leaves you wanting more than you get from it. This little stream in front of the fifth green is as effective and evocative a water feature as the entirety of Lake Oconee.